China was dominated by communist forces in 1927. 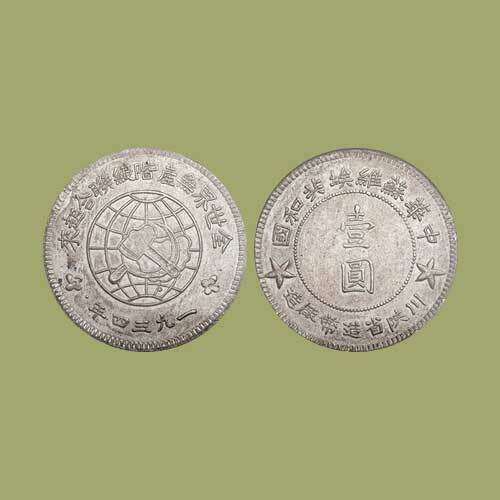 Experts believe that the first Soviet Chinese coinage in the form of a silver dollar was issued around 1930. The first issue and some of the next ones are difficult to find in higher grades. A 1934 Communist silver dollar, graded MS 62 by NCG, issued in the Soviet-controlled Szechuan-Shensi provinces, was offered by Heritage Auctions in Hong Kong on 7th and 8th December and sold for $19,200, against an estimated value of $20,000 to $30,000. The coin was well-preserved unlike other known examples of the type. The obverse features the hammer-and-sickle symbol against a globe along with two stars. The reverse features Chinese inscriptions.